Ask for prices for our last minute offer .If you want to spend a few days far away from noises and near everywhere this lovely new apartment in a residential and peaceful area, 100 metres from the luxury hotel La Quinta Park , 7km away from Puerto de la Cruz, and 4km from the historical town of La Orotava is the right choice for you.Very good relation price and quality. Prices go down depending on the lenght you stay. Urbanizacion La Quinta is a residential area, about 5-8 minutes driving from Puerto de la Cruz. It belongs to Santa Ursula, a typical Spanish village, which has not been spoiled by tourism. There are many typical restaurants there where you can enjoy nice food for a small amount of money and shops . It has the advantage that it is ideal for relaxing: no noises from cars, no problems with on the other hand all sort of facilities are only a few minutes away. It is the right place if you want to visit and see the island. I have a lovely studio in a hotel complex in Urbanización La Paz in Puerto de la Cruz, if you are interested ask for availability and prices. I have lived all my life in this beautiful island and since I was little I was in love with this residential area, it is peaceful and with sort of facilities around. 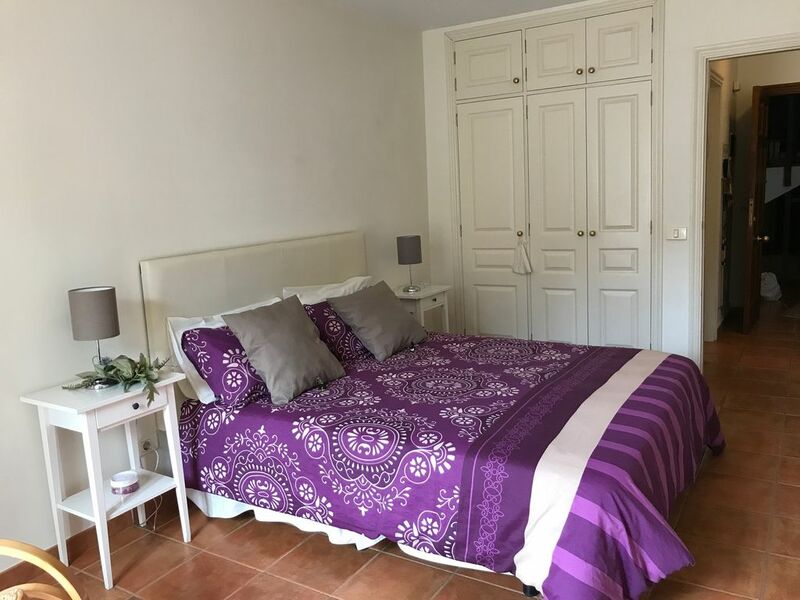 "The apartment is very clean and very quite, it's decorated with a good taste and there's lots of touristical information on Tenerife available. It is also fully equipped for self catering. The size is ideal for a family with 2 kids, but would also fit for 4 adults. The terrace and sleepingroom have a view on a small park with eucalyptus trees. In front of the block there's a cosy swimming pool in a large garden surrounded by nice housing complexes in pastel colours. For sightseeing you will need a rental car. Our favourite was Puerto de la Cruz and its seafront, which was only a 10 minute drive. Unexpectedly we discovered some of the nicest dragon trees on the island 5 min. from the apartment, walking to the end of a non paved road (near the garbage containers). We preferred the rough beaches nearby (e.g. Bolullo) to the crowded and hot beaches in the south. It was cloudy 50% of the time with a few showers, but always warm, and perfect to sleep at night or to hike during the day. The North has great mountains, lush forests, fantastic seaviews and offers lots of opportunities to meet locals. Our host Inmaculada proved to be very hospitable and her service and kindness stretched far beyond the duties of a property owner. All together we considered this as a perfect stay on a very nice island. We'll be back!!" Cómodo y agradable apartamento situado en una zona muy bonita y tranquila de la Isla. Inma, su propietaria, nos atendió de maravilla, dándonos un montón de consejos e indicaciones para poder aprovechar a tope nuestra estancia. Muy, muy recomendable, repetiremos seguro. Muchas gracias por los comentarios. Me alegra saber que se han encontrado muy bien en el apartamento .Es placer conocer personas tan estupendas, y una recompensa personal el saber que se han conseguido una vez mas los objetivos en los que pongo toda mi ilusión y esfuerzo, es decir, que disfruten al máximo de una agradable estancia, y se sientan como en su propia casa en esta zona tan bonita y tranquila. Gracias por todo. Saludos desde Tenerife y espero verlos el próximo año.